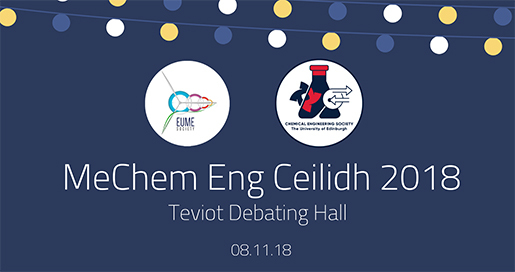 The Chemical and Mechanical Engineering Societies are pleased to invite you to a joint society ceilidh on 8th November 2018 in the Debating Hall, Teviot. Come dressed to impress, and enjoy a night of traditional Scottish country dancing, music and fun. Don't worry if you don't know the moves, the band will help you through. Even veterans need a reminder of how to dance the 'Dashing White Sergeant' now and again! Free glass of prosecco on arrival at Loft Bar. The ceilidh is open to everyone and we strongly encourage students from all other university courses to join us for an amazing night! We expect this to be a sell out event so get your tickets early to avoid disappointment.